Posted May 14, 2018 by Sage & filed under Media, Teaching, Yoga. 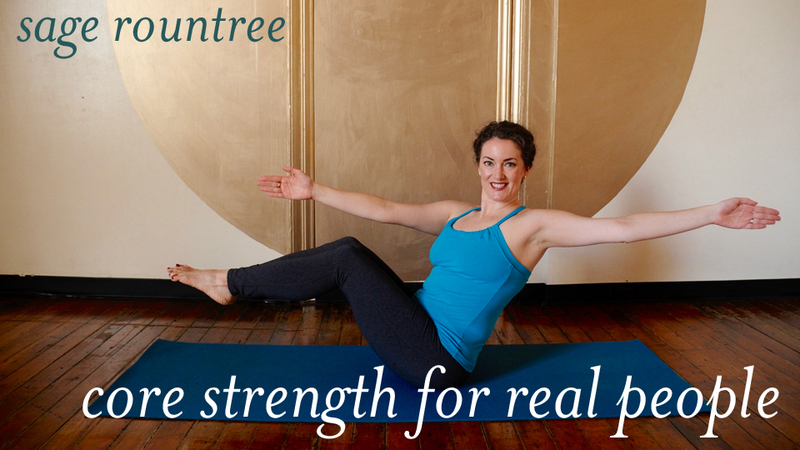 We have just a few spots left in this weekend’s Core Strength for Real People workshop at Carrboro Yoga. Join for both Saturday and Sunday, or for just Saturday morning and/or afternoon. Don’t worry—it won’t be 3–12 hours of core work. We’ll also cover the context of why, how, and when to do core exercises, as well as how to complement them with stretching and rest. There will be plenty of the latter! Can’t be there in person? Find short, do-able, combinable core routines at corestrength.sagerountree.com. Sign up for my newsletter and you’ll get a code for access to any one routine—sign up here. Posted May 10, 2018 by Sage & filed under Media, Teaching, Yoga. 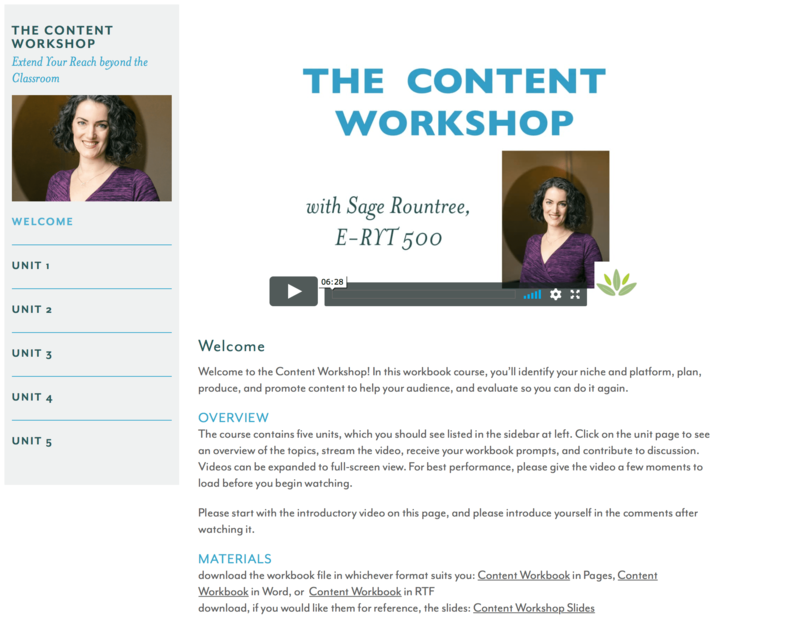 Last month, I launched the Content Workshop, a workbook course for movement teachers. (Read all about it here, and use the code SRWORKSHOP to save $10 on it or on the package of the Content Workshop and the Movement Workshop through May 31.) As I developed the course, I ran it past my most trusted colleagues for feedback. Each of them has developed some really useful content of her own, and I’m delighted to highlight these women’s excellent work the next few Thursdays. I’m so grateful to know wonderful people like Terry! If you’re inspired by her as I am, you can get started helping people with content of your own by taking the Content Workshop. Posted April 23, 2018 by Sage & filed under Media, Teaching, Yoga. It’s been a fun experiment to live stream my class weekly to Facebook and Yoga Vibes. What a treat to be able to reach students from all over, both those I’ve met in person and those I haven’t! If you’ve been part of that group, you know that we have been having ongoing problems with nailing down the setup, which required a complex combination of reliable Internet and wireless sound. This proved difficult in our downtown setting, where interference on the frequencies we needed meant we never knew whether we’d be able to deliver a full, smooth class experience. And of course I need to give my full attention to the students who are physically present! Thus, tonight will be my last stream to Facebook and the Yoga Vibes live stream beta site. But don’t dismay: you’ll find over 100 videos of my classes, long and short, at Yoga Vibes, and some of the original live streaming attempts at my Facebook Page. And we hope to have a live stream rotation once a month or so on Facebook, when we get the technical side worked out. Join me tonight at 6 p.m. EDT, and we can enjoy Yoga for Athletic Balance in real time! And the class itself continues, as it has for 14 years, at Carrboro Yoga. Posted April 3, 2018 by Sage & filed under Media, Training and Racing, Yoga. Want to maximize your efficiency while still working your core and building balance? The latest episode of Core Strength for Real People is here to help. In it, you’ll learn a full routine to wake up your core and lower body while also priming you for a run. You can even use these moves to get your socks and shoes on! And if you’d like to learn fresh ways to challenge your core while having a great time in central North Carolina, join me for Core Strength for Real People—live in Carrboro May 19–20. Read all about it here. Posted March 26, 2018 by Sage & filed under Teaching, Yoga. You know what’s fun? 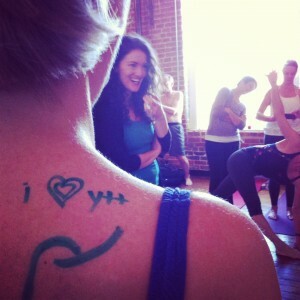 Yoga teacher training. Whether or not you ever intend to teach, undergoing a training helps you crystallize and deepen your relationship with yoga and with yourself. You’ll grow in all kinds of unexpected ways, and you’ll enjoy going through the program with a cohort of like-minded colleagues. It’s not too soon to be thinking about these! A typical first step is to take a class with me, ideally in person, but online if you aren’t local. This is not me assessing you; this is for you to assess me, specifically to see whether my communication style makes sense to you. You don’t need to want to teach like me; you just need to be able to understand my presentation style, as you’ll be listening to me a decent amount over the program. We can also chat a bit so I can answer your questions about the program. My classes are Mondays at 6 p.m. in Carrboro (Yoga for Athletic Balance—it’s NOT athletic yoga). If Mondays don’t work, you can get a sense of my teaching at Yoga Vibes. Or look at facebook.com/sagerountree, where I’ve been live streaming my class. Then we can set up a time to meet or chat on the phone, or you can send any questions over e-mail. The next step is to fill out an application! If you already have a 200-hour training under your belt, our advanced studies yoga teacher training (aka a 300- or 500-hour YTT) helps you go deeper. In the program, you’ll deepen your understanding of yoga pedagogy, philosophy, and professionalism and sharpen your skills so that you can better serve your students and your community. 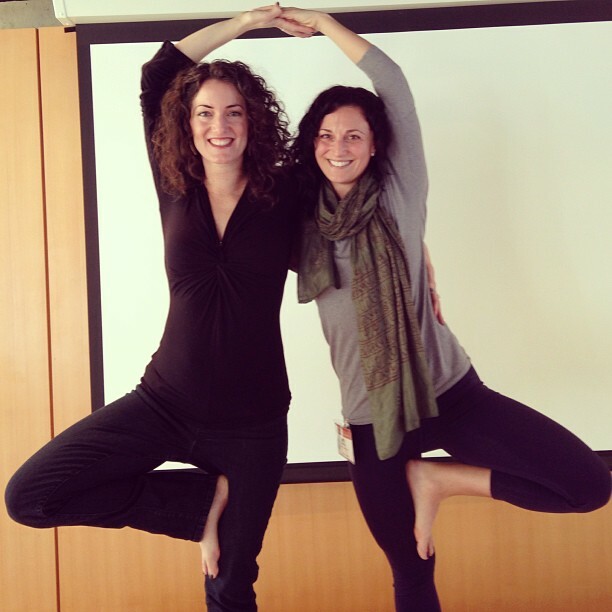 Our 500-hour yoga teacher training program contains both required modules and electives. 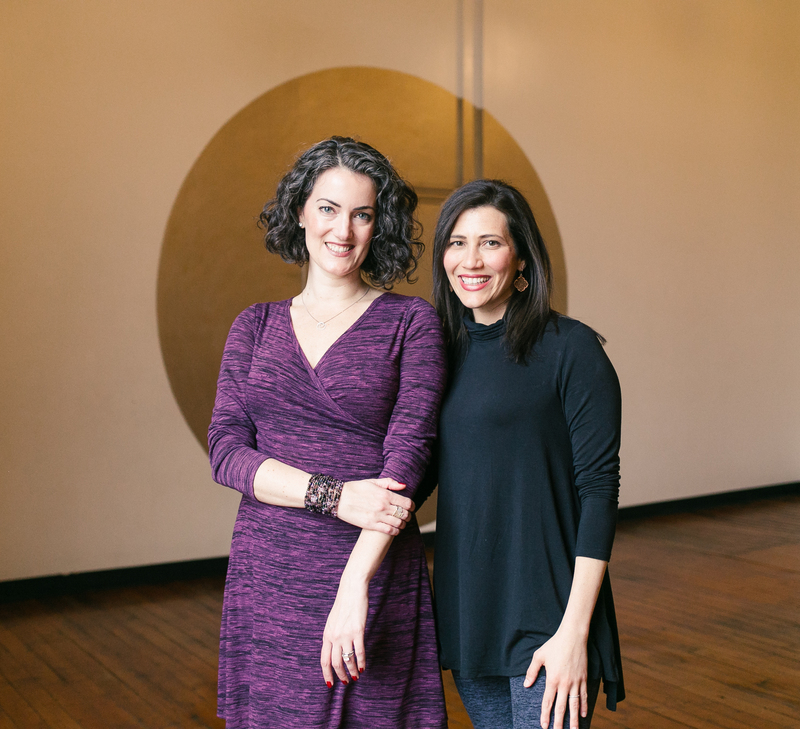 You’ll finish with a thorough grounding in alignment, anatomy, and yoga’s transformative tools, while having freedom to explore in depth the special topics that most interest you. We offer most of the core curriculum both over the school year (September 2018–March 2019) and in odd-numbered summers (summer 2019 courses are already scheduled, though our website presents only the next twelve months; click here to see everything we have on the calendar). You are also invited to take any of the modules à la carte, even if you are not formally enrolled in the program. See our continuing education schedule here.